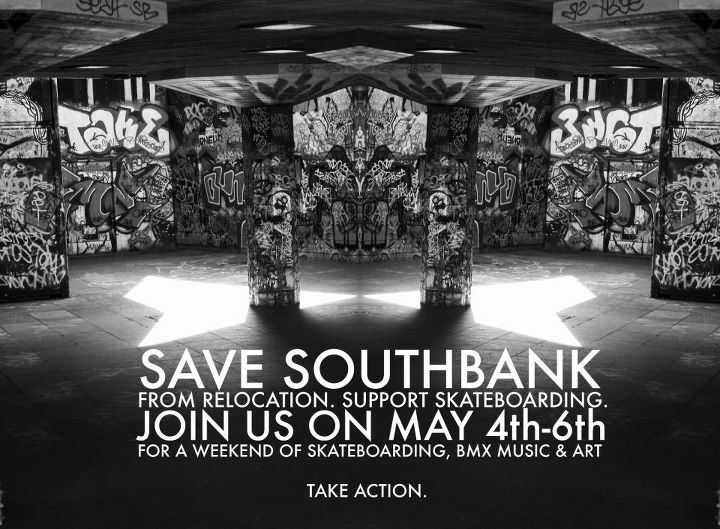 As part of a multi-million pound spend the people who run/own the Undercroft area better known to us as Southbank are wanting to re-develop the whole area and move the banks further down the river to a spot a few hundred yards away. As much as this could be a great opportunity to create a new space for riders, skaters and graf writers to use it will be taking away the very essence of what Southbank offers, a not so perfect, not purpose built area that has grown over the 30 years plus period that it’s been there into something which all people have learned to love and use on a daily basis, come rain, hail or shine. It’s become a massive tourist attraction too, it doesn’t matter if you ride or not but people passing the space love to get snaps and film whats going on down there and I myself have had some awesome times just hanging out with friends, filming, photographing or just passing by and seeing whats up. So in an attempt to help save Southbank a petition and a jam has been setup but they need the numbers, they need you to sign the petition and it doesn’t matter if you’ve rode there before or not, it’s a classic, well known spot that’s been in use for longer than most of us have been alive and it shouldn’t be demolished as part of a re-development of a piece of land. Get signing the petition here and check out the flyer and video below. Im going to upload some photos from my visits to Southbank for the crack, so keep your eye’s peeled for that!